From April 1st 2017, United States Citizenship and Immigration Services will begin accepting new h1b visa quota based applications. Applicants should note that the earliest date for commencing work will be October 1st 2017! 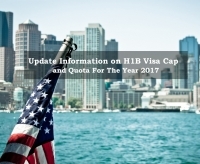 Information provided in Part C of the Data Collection for H-1B and Filing Fee Exemption Supplement is used to determine whether the petition is subject to the 65,000 cap. Exceptions are made for up to 20,000 applicants with a master’s degree or more advanced level of education. If numbers exceed this 20,000 mark before April 5th 2017, then a random lottery system is used to select applicants from that 20,000. An additional lottery then takes place for petitions under the regular 65,000. The following applicants are not subject to the annual quote for H-1B. Where the applicants employer is an non-profit organization or an affiliate of a higher education institute or an employee of the Foreign National Beneficiary. In the case of an employee for the Foreign National Beneficiary, who has been granted non-immigrant status and not left the US for more than a year since that entitlement. Those who are planning to submit petitions should be aware that in April 2016 the regular visa cap of 65,000 was reached in just 5 days and a total of 236,000 H-1B applications were made altogether.